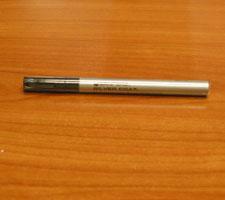 Silver Liquid Thin Tip Pen by Uni-Paint | Sports Memorabilia! Silver Liquid Thin Tip Pen by Sanford/Uni-Paint. This pen is frequently used for autographing dark colored mini helmets, some cards and paper material. These paint pens work best for chrome helmets along with many other items such as photos, helmets, jerseys, etc.